Zero miles running today. Lots of working and shuttling kids back and forth to activities. Eight miles in the early AM. Cold, windy. Don't let this become the Fast Mud-Run Blog! Just say no. PM: 4.5 miles on the treadmill. Then I did some strength/core exercises. AM: Two mile walk around Sandy thinking about what I might learn my students today. Too nice out to sit at my desk. Planning on an 8 mile gully run with some hill repeats this afternoon. PM: 8.25 trail miles in the gully in 1:05. Not a bad time for the gully. Picked Jon Kotter up this morning and went up to Jeremy Ranch. Almost a perfect day for a run up there. 15 miles in 1:53:30 plus a handful of striders at the end. This was maybe the quickest I've ever ran this run. We saw four deer and one moose. The moose was walking right down the dirt road and didn't seem very shy of humans. Managed over fifty miles for the week in five days. I've been feeling pretty strong the past couple days. Eight miles around the neighborhood in 59:55. "Easy" pace is getting faster. I would say that my comfortable aerobic pace is 20 to 25 seconds faster than it was two months ago. No signs of injury. If I keep a handle on my diet and remain positive and focused, I should be able to string together a few good races. The only negative today was the two to three pounds of pollen I swallowed or inhaled during the run. 10.25 miles on the treadmill during Abby's swim practice. Did about 3 at 6:20 pace. Interesting that I "bonked" about 5.25 miles into my run today. 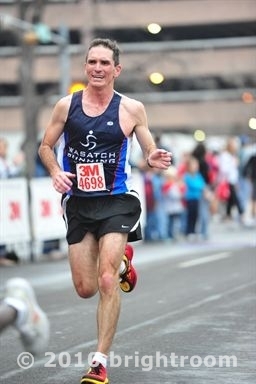 I've been running for about 35 years so I know what this feels like. The thing is, I don't know why. I ate well today. Good breakfast, good lunch, mid-afternoon snack and a cup of coffee. But about 5 miles into my run I began feeling weak and light headed. I kept at it for a while hoping it would go away but it didn't. Fortunately I has a goo and some Gatorade in my locker so I stepped off the treadmill for a minute and slurped down some engineered calories. I felt great after about five minutes and had no problem the rest of the run. Frustrating day. Maybe no time for a run. I won't get home until seven o'clock or later. 4 X 1 mile with half mile jog interval. AM: Two mile walk/jog around Sandy. 100 push-ups, 100 sit-ups, and some core exercises. PM: 1.25 mile warm-up jog on the treadmill then I proceeded over to the Stair Master and commenced to climbing. I did 501 floors in 60 minutes which is apparently 10.5 miles. I was breathing like I was at my threshold most of the way but it was cross training so I'll count it as easy miles. I know that many of you purists wouldn't count these "miles" at all. My legs are wobbly now. I feel good about this workout. I just read where Colorado has banned beer with less than 4% alcohol from being sold in restaurants and bars. That is basically the opposite of Utah's law which only allows 3.2 beer in most cases. I believe Colorado's governor used to own a brew pub. That won't ever happen here. AM: 6.5 really slow miles around the neighborhood. Busy weekend planned. AP practice exam at school tomorrow, Ann working nights, lots of kids activities. I'll try to squeeze in some running. PM: 7.5 miles on the gully. Getting heat acclimated! 7.5 miles in one hour around Sugarhouse. Didn't get out til 5 pm. I was just watching the Bojangles Southern 500 NASCAR race and they briefly showed this section in the stands where all the wives and girlfriends of the drivers sit. Will Ferrell wasn't making anything up in Talladega Nights. Total of 18 miles this morning. I ran an easy couple miles in the neighborhood finishing at Highland High where I met Jake, Nate, and Kevin. I did a few striders in the parking lot and then ran about 11 miles up through Tanner Park, down Wasatch past the Hogle Zoo and then back down to the school. I wanted to do a few extra so I circled the neighborhood a few times. Finished up with 16 miles in 1:59. I was feeling the heat a bit towards the end. So I'm flirting with my first 20 miler in over a year. It could happen. AM: Two mile walk around Sandy. I'm doing more walking because I like it and because it's a way of getting down to my lean racing weight of 140 pounds without any additional wear and tear. PM: Five fairly hard miles on the elliptical. Millennials are lazy, entitled narcissists who still live with their parents. Why they'll save us all. Totally failed in my plan for today which was a 15 mile trail run in the gully. The AP Exam is tomorrow and my planned one hour after school review turned into 2.5 hours. By that time I was beat and lacked focus and needed to get home to the family so I bailed on my plan and did 9.25 miles in the air conditioned gym (record 93 degree heat here in Utah) on the treadmill. Way better than nothing. I need to get a workout in tomorrow. AM: Two mile walk while my kids were taking the AP Exam. I'm exiled from my classroom for much of the day so might as well go for a walk. I get nervous for them. Most of my students have worked very hard all year and deserve to do well. I did 4 X 1 mile with a quarter mile walk/jog interval. Splits were 5:48, 5:42, 5:39, 5:33. Couple miles each for the warm-up and cool-down. This workout was done on the treadmill because it's way harder than the track or road. For all of you dying to know, the topic of the DBQ on the AP Exam was the rise of abolitionism between 1776 and 1852. Unplanned and unwanted day off. Now I'm cranky. AM: Easy 8.25 mile run around Sugarhouse and Millcreek. Legs felt good after the day off yesterday. PM: Second workout this week. 17.5 (2:12:30) miles in a chilly rain on the Jordan River Parkway. Ran generally easy but over the last few miles I alternated hard/easy 400s. The hard efforts were 80 to 85 seconds. First seventy mile week in a while which is pretty much where I will top out this year. There are few things I know for certain in this world, but one is that I can't handle much over 70 mpw for an extended period. The good news is that my body doesn't seem to need much more for the times I want to run. Here's something I was wondering today. Why is it that cities and towns in Utah often put the word "city" after their name? For example, "Sandy City". I obviously understand it when the word is actually part of the name as in Kansas City or Salt Lake City. I never heard of Anaheim City or San Diego City when I was growing up. Is this just one on Utah's many endearing little quirks? AM: Two mile walk. 100 push-ups, 100 sit-ups. Some dog walking as well. PM: 3 mile walk around the neighborhood with Ann. I decided to give myself 2 miles of running for my 5 miles of walking today. Yep. 8.25 miles around Sugarhouse park (1:02:45). Had a nice meeting after school today with my returning cross country boys. We will have a very good team in the fall that will be able to challenge the best teams in the state. AM: Two mile morning constitutional. took some time to smell the flowers. 1 to 1.5 bananas, some frozen blueberries, blackberries and raspberries, some cranberry-pomegranite juice, two tablespoons of wheat germ, one huge scoop of Muscle Milk protein powder, a bunch of plain yogurt or Greek yogurt. Plus a few miles warming up and cooling down. 7.5 miles in the gully. Good run. Ten miles in 1:13:36 around Sugarhouse and Millcreek. Windy. I don't care for wind over about 5 mph. AM: 7.25 miles in the gully at 6 AM. I saw seven deer and one bunny rabbit. No carnivores. PM: Two mile walk around school. I am thinking of a gym workout this evening but I'm pretty tired. So I'm not sure. Good gully run today. Started out with an easy 4 miles with some of my cross country runners then did the 7.25 mile gully long run by myself in 56 minutes. Pretty fast for the gully. Did a light weight workout after. Annual Murphy family yard sale today! AM: 5.5 easy miles around Liberty Park. Six fast striders at the end. PM: 3 mile walk around the neighborhood. Long run tomorrow if the stars align properly. 20.25 in 2:32 - all of it circling Liberty Park. Lots of activity at the park this morning. I saw Bill Cobler with his East High kids, Demetrio Cabanillas, the whole Erickson clan, and I was able to do a couple laps of the park with Emily Jameson which helped pass the time. I finished up the run with some fast striders at the end. Good to run fast on tired legs every so often. I'm almost certain that this was my first 20 miler since May, 2012. I'm happy with this run. I felt good. I didn't dip under 8 minute pace until the fourth mile and still averaged 7:30 for the run. I'm feeling pretty strong 12 days out from the Utah Valley Half and a month out from Grandma's. Rest day. Just a 2 mile walk in the morning. PM: 125 push-ups, 125 crunches, core workout. 10.25 miles in the lower gully in 1:17. AM: Speedy two mile walk in Sandy. Workout this afternoon. PM: A fine workout today. 1 X 1/4 mile in 80 seconds. 10 miles in 1:18 in the gully. Another beautiful day. I always classify gully miles as "easy", but I always feel like I've accomplished something when I run in there. Jake is out running with my cross country team now. After practice I'll be heading to Abby's swim meat up at the Draper pool.